abuses in their home country of Ethiopia. Married couple Lensa Dinka and Marama Kufi make a formidable team. 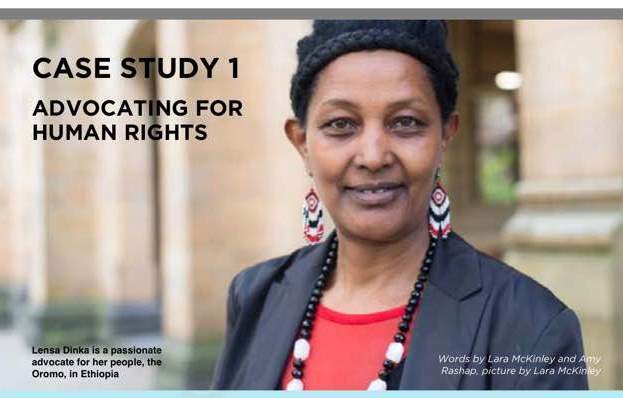 Since arriving in Australia in 1999, the pair has worked tirelessly to expose the human rights abuses inflicted upon their people, the Oromo and are officers of a small yet highly effective diaspora organisation, the Oromo Support Group Australia (OSGA). Lensa explained: “Oromo are the majority of the people in Ethiopia but do not have any voice, political rights or any freedom of speech. People are being killed voicing human rights issues. “The issue burns me from the inside,” she said. A presentation given by Marama at the Diasporas in Action conference clearly highlighted why: in slide after slide he bore witness to the murder and torture of his people — reports the OSGA continue to receive daily. Finding a forum to present these findings wasn’t always easy, Lensa said. “For ten years we tried to do something for our people, for Australian society to understand our issues, but we couldn’t get anywhere. “We started getting in contact with government bodies, with NGOs and our calls [reached] people who had never heard about us,” Lensa said. Marama also noted appreciatively that through various DAA workshops and mentoring programs, the OSGA has gained invaluable skills in communications, organisational management and leadership. In July this year the OSGA were given a special consultative status by the United Nations Economic and Social Council. This means their group is regarded as an official source on human rights abuses in Ethiopia. They are the only Oromia diaspora group in the world to have this status. Marama agreed and said that his experiences at the Diasporas in Action conference have deepened his thinking, helped him build valuable connections and gave him practical solutions. “This conference really reinforced how important it is for diaspora communities to network with a variety of other organisations. We have to really learn what each other is doing in order for us to become more effective. “We were able to make very valuable contacts: we spoke with Amnesty International staff, an officer from the International Organisation for Migration, as well as with many presenters, speakers and various agency delegates. “We found the conference very inspiring, and we were moved by the participants’ determination to go back to their original country to make a change.